For the month of February, the students will be learning about the virtue of unity. The virtue of unity is essential for character development. It is through unity that we can foster cooperation, acceptance, compasion, and understanding. Unity is having a sense of connectedness eventhough we might be miles apart. The virtue of unity is highly valued at St. Bernadette’s. We desire to be united with our families, our parish and the wider community in order to provide the best education for our children. As we focus on the virtue of unity this month, our actions, words, and overall attitude must reflect this virtue. How do we treat others, especially those that do not share our same values? How do we speak and treat those who are different from us? In what ways are we creating opportunities to foster a sense of unity at home, at work, on teams, in clubs, at school? 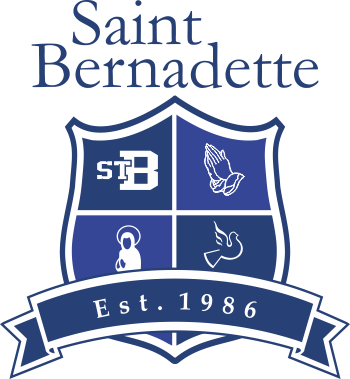 Together, in unison, we will work towards a culture of acceptance, cooperation, understanding and compasion at St. Bernadette’s. Income Tax receipts are available for pick-up at the school office. You must sign for the receipt. If you are having someone else pick it up, they must have a signed note from you requesting that they have your permission to pick up your Tax receipt. Please make a copy of the receipt in the event that you loose or misplace your original receipt, replacement receipts will NOT be issued. Parents are reminded to submit this tax under “Charitable Donations” section of their income tax return. School Mass will on Friday, February 27th. On Mass days the bell rings at 8:45am. If your child is late for school on a Mass day please bring him or her to the school first to sign in at the school office. Students must be in full school uniform. Parish donation receipts are available for pick-up in the Gathering Room in the Church. On Thursday, February 26th students are encouraged to wear something pink to symbolize that we as a society will not tolerate bullying anywhere. We will have our Bully Awareness Day assembly at 11:15. Everyone is welcome to attend. For more information about Pink Shirt Day please see the website at http://www.pinkshirtday.ca/. If your child is away for any reason, it is imperitive that an absentee note be sent to the school indicating the reason of the absenteeism. It is not the school’s responsibility to notify you if a note has not been handed in. The Ministry of Education requires a note from students who are absent. Failing to submit a note may jeopardize your funding from the government. Application forms for new students for the upcoming school year 2015-16 are now available and can be picked up from the school office. Families who have children entering Kindergarten will be given the application form with the Re-registration package. Promotional Event: Current families get their re-registration fee for the following year (currently $150) waived if they refer a family that stays the year.